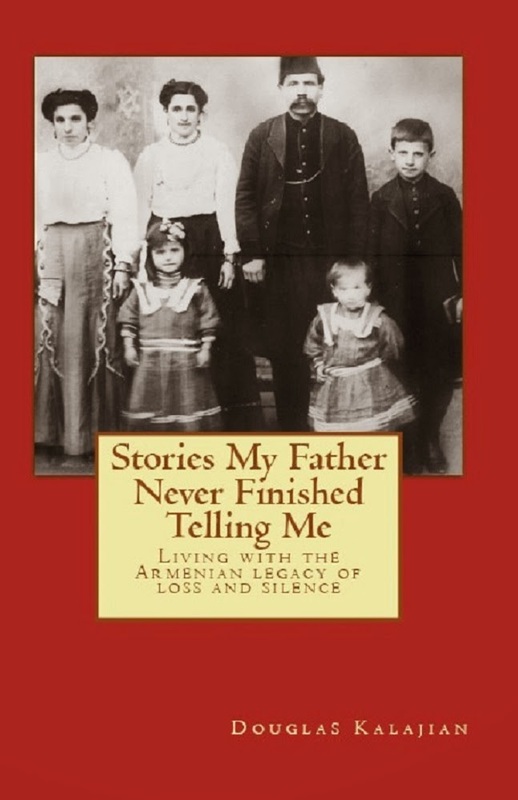 TheArmenianKitchen.com : Savory or sweet, it's still chorag! 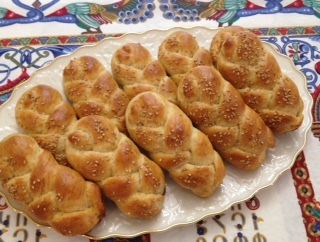 The Armenian Kitchen's version of Anne Marootian's 'Savory Chorag"
Chorag is a traditional Armenian braided yeast roll. Some like sweet chorag; others a bit savory, so the recipe (and spelling) varies from household to household. But whatever your preference, chorag is always served with cheese and strong coffee. Some cooks might be a bit intimidated by the intricate shape, but don't be fooled. It's a snap. Check out our video to see how easy it is. 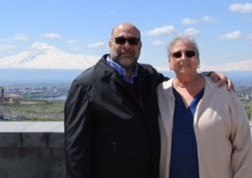 A unique chorag recipe was handed down to my family from a dear family friend who, in my humble opinion, was one of the best Armenian cooks in New Jersey – Anne Marootian. Unlike many chorag recipes which tend to be sweet, this one is on the savory side with the addition of ground mahlab, anise seed, fennel seed, and ginger. It might sound like an unusual mix of flavors, but it’s quite delicious! ** NOTE: Before you begin, test the baking powder to make sure it is ‘active’. To do this, simply sprinkle some baking powder into a small amount of tap water. If it is active, the baking powder will fizz and foam. 1. Melt butter in a saucepan. Add milk and heat to a gentle simmer (do NOT boil). Cool. 2. Beat egg and add to cooled milk. 3. In a small bowl, dissolve yeast in ¼ cup warm water (about 105-110° F). You can check the temperature with a food thermometer, or by putting a drop on your wrist. If it feels comfortable to your wrist, the temp. is good to go. Set aside. 4. Mix sugar, salt, spices, and baking powder together. Set aside. 5. Place 5 cups of the flour into a large mixing bowl. Combine the blended spice mixture into the flour. 6. Add the milk-egg mixture to the dry ingredients. Stir in the dissolved yeast and mix well. 7. Place dough on a lightly floured work surface and knead dough until it is smooth and elastic, about 10 minutes. (This can also be done in an electric stand mixer using a dough hook, but only mix for about 2 minutes.) If the dough seems a bit sticky, add some of the extra ½ cup flour that wasn’t used earlier. 8. Place dough in a large, clean bowl, cover with plastic wrap, then cover that with a towel. Allow to rise for 2 hours. 9. Break off about a golf ball-size piece of dough (roughly 2 ounces for each piece). Roll it into a long, thin rope, about 15 inches in length. Break off about one-third (5 inches) of the dough. Shape the longer piece of dough into a horseshoe (U) shape. Place the shorter piece of dough in the center of the “U”, and begin braiding the 3 strips of dough. 11. Cover the unbaked chorags with plastic wrap and let the shaped dough rise on the tray for one more hour before baking. 12. Remove the plastic wrap and brush tops with the egg wash. Sprinkle chorag tops with toasted sesame seeds, if desired. 13. Bake at 375° F. on the bottom oven rack until the bottom of the chorag is golden (about 15 minutes). Then transfer the tray to the top rack until the top of the chorag is golden (about another 5 minutes). Cool chorag completely on wire racks. 14. Continue this procedure until all dough is shaped and baked. 15. Store completely cooled chorag in a container with a tight-fitting lid. If you plan to freeze them, layer the chorags in a plastic storage container with parchment paper or plastic wrap placed between the layers to prevent them from sticking to each other. Alternately, chorags can be frozen in freezer bags. Chorags can be thawed in the microwave by simply wrapping each chorag in a slightly dampened paper towel, and microwaving for about 20-30 seconds on low power, or until defrosted. Chorag can be served anytime of the day or night with coffee, tea, Armenian string cheese – or - an assortment of cheeses, fruit, etc. My grandfather loves this! He is Armenian..well i am to, and we make it every easter, except we use the blackk seeds inside of the choreg and put sesame seeds on the outside! Great Recipe! Robin, I read another recipe of choreg that call for use of clarified butter (Ghee). What are you recommend ? Clarified butter can certainly be used to make chorag. If you try making the other recipe, I'd love to know how it worked for you. My father's 88 birthday is coming up and his favorite Cheoreg is not sweet. He says it has a licorice flavoring but not sweet. He describes it as having black seeds and he loves this cheoreg. Is this something an amateur can do and do well! Some cooks seem to be intimidated when working with dough; it's really easy. If shaping chorag into braids doesn't appeal to you, make any shape you like - sticks, circles, 's'-shapes. This recipe, which is not sweet, provides the licorice taste from the ground anise seeds. The ground fennel seeds and ginger add a nice touch, but may be omitted. Nigella seeds or black sesame seeds can be added as well. Good luck, and Happy Birthday to your dad! I would like to take (sincerely polite) exception to "it is always served with cheese and strong coffee". My Nanny made this every Christmas and Easter, and I have no memory of my Nanny ever serving it with cheese. Oh how we loved this bread. Thank you for sharing your family's recipe. My mother and grandmother would make I believe it was a choreg with a cheese topping it almost looked and tasted like what you would use for Bedek. Is that so. Can you help me out I'd like to try to make it but I am not sure what I would use.I believe that the dough is the choreg base and then that was placed in a shallow pan and made into a valley for the cheese filling to be put in the valley and then cooked. I have no ides what they call that either. Hello Steph, Please forgive my delay in responding; I am recuperating from surgery. I don't have a recipe based on your description, and my research has not revealed one like it either. The closest recipe I can provide is one my grandmother used to make, banerov hatz, dough that's topped with a mixture of cheeses, onions, and seasonings, then baked. Onions may be omitted. If you'd like, I can post a request; perhaps a reader will have a suggestion. I csn't find my mom's recipe and was going to make this by myself for the first time. I'm curious if one egg is correct for that much flour. I know there are thousands of chorag recipes out there, and I like the recipes I've made from your blog. Thank you for your help, and I hope you're feeling better after your surgery. Hi Ani, I've been making this recipe for decades with great results using one egg in the dough. Make sure it's a large egg and it should be fine. BTW, I'm healing well - thanks for your concern. Happy Easter! Thanks for the help. Happy to hear you're on the road to recovery. I'm just curious, I made a different recipe and did not like the results, too dry and crumbly. It too had baking powder. Why add baking powder to a yeast bread? This answer comes from a molecular biotechnologist: "Yeast is added to bread because it metabolize sugars in the dough to produce alcohol and carbon dioxide. Alcohol improves the bread taste and carbon dioxide increase the size of the dough. Baking powder is added to dough to improve the texture." I couldn't have said it better. Hope this helps! I love chorag but have developed a bad wheat allergy does anyone know how to do this gluten/wheat free and with no egg?